We made several trips in 1997 to Iowa. We crossed it quickly in tourist fashion on Interstate 80 in big Jeep SUV, and we also slowly wandered its back roads in a little roadster. In Pella, they show off their Dutch heritage with windmills. They also make windows and run a musical clock called the Clockenspiel. Over in Madison County, the covered bridges still stand and glow red in the early morning sun. 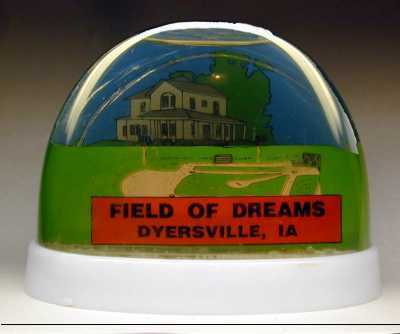 Baseball fans and movie buffs can run onto the Field of Dreams in Dyersville and get conked on the head with a fastball. In the Amana colonies, you can get a great meal and fill your car trunk with handmade crafts and machine made refrigerator parts. This is all well and good. So how are their snowdomes? Everywhere we went, it was the same. Pigs. Pigs. Pigs. What about the Bridges of Madison County? Des Moines? Amish Settlements? None. It's pork. 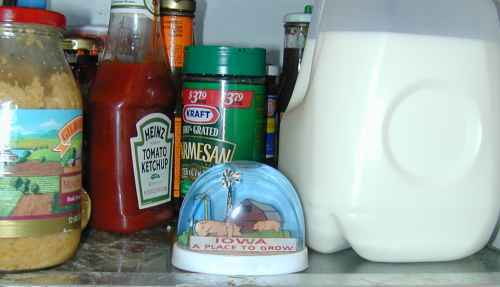 If you're on a diet, put one of these domes in the refrigerator as a reminder. Just don't be like Mr. Boffo from the newspaper comic strip. 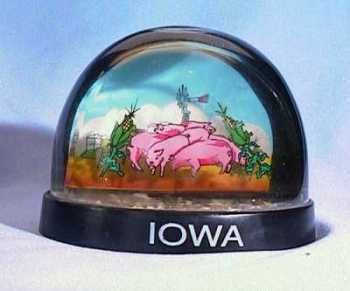 Plastic pigs in his icebox just remind him how much better his snack will taste with bacon. 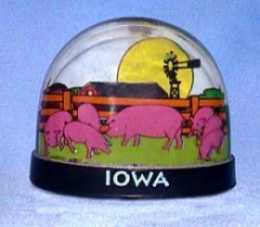 Update: 3/6/2001 After several irate Iowans sent me nasty email about my pigs, I have now added the Dyersville snowdome to mollify them. It celebrates the movie set used for Field of Dreams, a wonderful movie about faith and baseball. The film was shot near Dyersville. The set included the farmhouse and baseball field. The land owners left it all intact and people like me came to see it. Soon, two gift shops appeared on both sides of the diamond. They offer all kinds of trivia, including heat sensitive t-shirts where ghost ballplayers appear on your chest if you get hot. 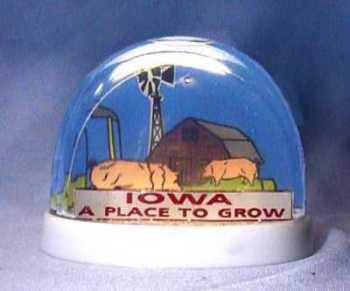 I purchased the snowdome in 1997. It's a big one. When I went back in 2000, the snowdomes were all gone. OK, what kind of nut would go here twice? I recall reading the George Bush Sr didn't understand the movie's ending , but that George W, an ex-baseball mogul himself, reportedly had tears in his eyes. Me too, but I still voted for Al Gore. Finally, Doctor Todd Wyatt. 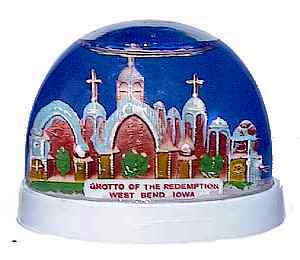 a very esteemed snowdome collector, sent me the Grotto of the Redemption dome, which is proof that good low-fat snowdomes can be found in Iowa. I'll have to visit this grotto someday. Then I can pass thru Dyersville a third time. Hey it's free to get in, and there is collection of cast iron toy tractors a few miles down the road that I haven't seen yet.